Stephen Strasburg has a torn elbow ligament and will likely have Tommy John surgery, bringing the pitcher’s promising rookie season to an abrupt end. The No. 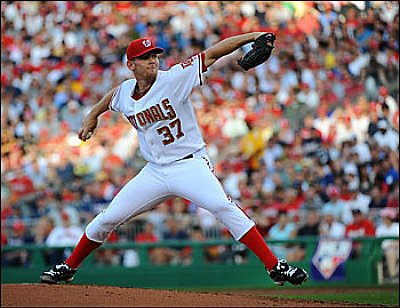 1 overall pick in the 2009 draft, Strasburg struck out 14 batters in a sensational major league debut in June. He is 5-3 with a 2.91 ERA and 92 strikeouts in 68 innings with the Nationals, who have kept him on strict pitch counts and had planned to shut him down once he reached about 105 innings. Pitchers have recovered from Tommy John surgery and gone on to have a good MLB career but many more have had their careers ended. This doesn’t look good for either Strasberg or the Nationals. I expect Strasburg to come up with a lame arm by the time he is 25. He’s 21 and his arm isn’t mature. Strasburg’s first outing was excellent, so the club is not likely to turn back to a more patient course with this pitcher. Baseball history has a long list of pitchers who came out gangbusters Dwight Gooden, Steve Busby, Wally Bunker, Mark Fidryich, and more but faded rapidly usually due to arm woes. If I recall correctly, Bill James said the only HOF pitcher to have impact as a rookie was Tom Seaver. Well I was off by three years on when Strasburg would have his arm fall off. Earl Weaver said the best place for a young pitcher is long relief. Rookie sensation Stephen Strasburg was diagnosed with inflammation in his pitching shoulder after being scratched from his scheduled start for the Washington Nationals on Tuesday night because he had problems warming up his prized and powerful right arm. Nationals general manager Mike Rizzo said Strasburg had “stiffness and discomfort” in his right shoulder, but an MRI and X-ray show no structural damage. “Given a couple days’ rest and anti-inflammatories, he should be better,” Rizzo said. The Nationals did not make Strasburg available for comment, saying he went for tests immediately after he encountered trouble. He was supposed to start Tuesday’s game against the Atlanta Braves; instead, Miguel Batista was summoned on short notice and earned the win with five shutout innings in Washington’s 3-0 victory. Rizzo said Strasburg is day to day and he’s not certain when the righty will pitch next. “We’re still not sure where he’s at,” the GM said. I stick by what I said. Earl Weaver said the best place for a young pitcher is long relief. WASHINGTON — For all the hype and expectations, projected debut dates guessed and re-guessed, every word and soundbite, millions though they were, one typically critical detail of a starting pitcher’s pregame routine was absent Tuesday night. Nationals rookie Stephen Strasburg never looked at a scouting report of his opponent. “I was just trusting everything he called,” Strasburg said after the game, referring to his future Hall of Fame catcher, Ivan Rodriguez. 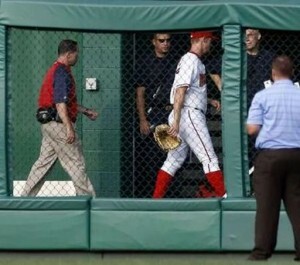 Strasburg said it so earnestly that maybe he didn’t understand the magnitude of what he had just accomplished. Hailed as the savior of baseball in D.C., the No. 1 overall pick of the 2009 draft, whom some scouts described as the greatest pitching prospect of all time, had somehow managed to match or even exceed the exorbitant expectations placed upon him by striking out a Nationals-record 14 batters in seven innings of no-walk, two-run ball in a 5-2 win over the Pirates. He interspersed 100 mph fastballs between curveballs and changeups that plummeted to the earth as if gravity’s pull suddenly grew stronger just before home plate. As commentator George Will, a Nationals season-ticket holder who was among the sellout crowd of 40,315, once wrote, “Sports serve society by providing vivid examples of excellence. Only time will tell if Strasburg becomes a truly great pitcher, or whether he burns out after a few seasons. So far, though, he’s doing well. The Milwaukee Brewers claimed right-hander Marco Estrada off waivers from the Washington Nationals. The 26-year-old has pitched in parts of the last two seasons for Washington, going 0-1 with a 6.14 ERA in one start and three relief appearances last year. 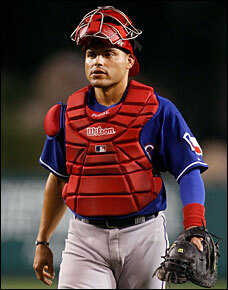 He was drafted by the Nationals in the sixth round in 2005. To make room for Estrada, the Brewers designated right-hander Tim Dillard for assignment. As I see it, Estrada over Dillard because the former has more potential. Both are 26-year-olds and rate as middle relievers at this moment. Why I think Estrada has more potential is pretty simple. He strikes out more batters than Dillard. His fastball is in the low 90′s and is said to have a good changeup. The problem Estrada has had in the majors so far, is his tendency to give up gopher balls. Estrada has had the same problem in the minors. Both these guys are probably going to have little impact in the majors, but if one of them does, I would bet it is Estrada. Note- This is my 2000th Blog post at OTB Sports since I began writing here in May 2006. A Dominican Republic tribunal has ordered the Washington Nationals to pay $40,000 in damages to a scout who was fired after signing a prospect who lied about his age. Jose Baez, the Nationals’ former director of operations in the Dominican Republic, sued the team for what he said was an unjustified firing. The court issued its order last week. In 2006, Baez and special assistant to the general manager Jose Rijo signed a player who identified himself as 16-year-old Esmailyn Gonzalez. The Nationals gave the player a $1.4 million signing bonus. A Major League Baseball investigation determined Gonzalez was about 4 years older than he said and also lied about his name. At least two other MLB teams have had recent problems with Dominican Republic recruiting. Kickbacks, falsifying one’s age, and steroid use seem to be the norm for some MLB hopefuls.